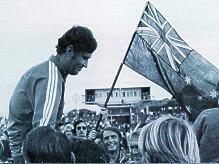 Australias road to the World Cup 1974 started with a tournament of six games, five of them at home. After a few friendly matches against Bulgaria, the Socceroos were ready for this big Soccer adventure. 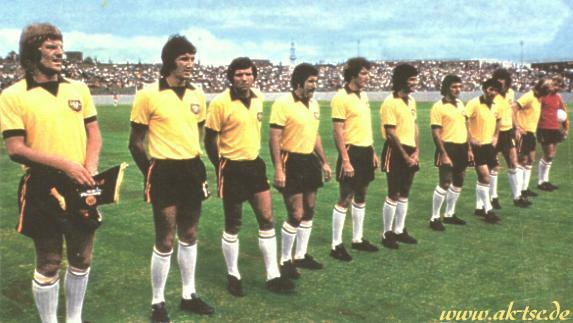 Australias march started on Sunday, March 4, 1973 in Auckland's Newmarket Park ground, where the Socceroos drew with New Zealand, 1-1. The Australians were having one of their poorer days, and in the end got what they deserved against a very ordinary Kiwi side. The Australian midfield simply did not exist, the defence was unable to hold NZ danger-man Brian Turner, who opened the scoring in the 57th minute. 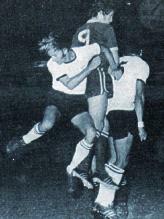 Alan Marley had been pushed to the ground by an Australian and the free kick had been quickly relayed to Turner who drove it hard and low into the net. 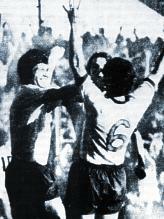 Coach Rale Rasic replaced Max Tolson with Ernie Campbell in the 67th minute and Johnny Warren with Atti Abonyi in the 77th minute. The appearance of Campbell was what saved Australia from defeat. Five minutes from the end, in a goalmouth scramble, Campbell was on hand to score the equaliser. It was all-told an unsatisfactory start, and the only good that came out of the match was that it was one point gained from an away match. Doug Utjesenovic had been the star of the match with his penetrating overlapping runs and crosses. Following the Newmarket Park game, Australias stocks had slumped. 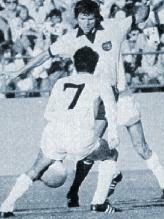 The team was changed, with Jimmy Mackay, who had been injured and did not play in Auckland, replacing Warren, and Jimmy Rooney replacing Tolson. Everything fell into place. Australia pulled off their best result up to that time to beat the Qualifying Group favourites. Ray Richards managed to put a foot to the ball from a free kick taken by Bobby Hogg and deflected the ball into the Iraq net in the 49th minute. In the 80th minute Adrian Alston added a second goal when he headed in from a Rooney cross, and suddenly the Iraqi defence began to crumble, Ray Baartz, Jim Rooney and Doug Utjesenovic outflanked the Iraqi defence and when Utjesenovic sent in a cross, Alston crowned this beautiful move scoring his second in the 85th. Now leading by three goals, Australia had nothing to fear. The great display by the Australians, especially in the second half, produced one big grin in the stands, as if every man and women present had a personal share in it. Nuri scored for Iraq. After the magnificent show against Iraq just two days before, the crowd was ready to cheer and applaud every move from the Socceroos, but there was very little to enthuse over. Campbell made the score 1-0 in the 22nd minute after goalkeeper Pasla had dropped a high cross from Utjesenovic, but 13 minutes later, Utjesenovic lost the ball to Sihasale whose cross was delicately back heeled into the net by Iswadi for the equaliser. In the 42nd minute Richards was brought down by a tackle, Baartz sent over the free kick and Adrian Alston rammed home the winning goal. At first things did not go too badly. On the contrary, Australia were leading 3-1 at one stage, which was a comfortable lead in any language. But the Australians let their opponents get back into the game, and taking advantage of some appalling errors of the Green and Gold, the New Zealanders evened the score. 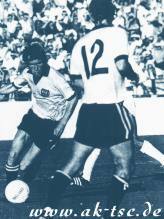 Alan Vest shocked Australia in the 10th minute when he chipped the ball over goalkeeper Ron Corry after having outplayed two defenders. However, Australia responded appropriately when Utjesenovic went on a 40 metre run, played a one two with Alston and slammed the ball into the net for the equaliser. 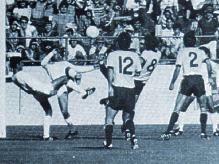 Nine minutes later Alston headed a Hogg free kick back towards advancing Ray Baartz whose goal put Australia into the lead. Branko Buljevic headed Australia further ahead after one of Richards incredibly long throw ins in the 26th minute. But Tindall scored just after half time for New Zealand and an own goal by Hogg four minutes to the end made the final score 3-3. This match, though ending in a scoreless draw, was more than a creditable performance.But there was a nervousness born out of a disappointment in themselves, as the players were afraid they would put on another shabby display. However, the Aussie players settled down, and it became obvious the Iraqis would not win this match. Play was not the most important thing as both teams knew how important it was to win. Coach Rasic changed Keepers before that match. After he conceded three goal against New Zealand, Corry was out of the race and was replaced by Jimmy Fraser. 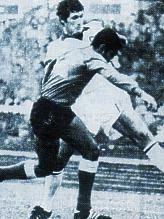 Afterwards, Iraqs coach Gyula Telecki complained that the Socceroos style of play had been more like rugby. "We came thousands of miles to play soccer. We did not care if we lose a match but we did not come all this way to lose one of our players." Rasic was happy with the draw. "We were the better team right through and Iraq did not have a single opportunity to score." For the Iraqis, a draw was not enough. But Australia, which now needed only one more point from the last game against Indonesia, the draw was sufficient. And win they did, six nil! Australia had got past the first hurdle. Under pressure to win by a big margin, the Australians turned it on and kept the Indonesians under a 90 minute barrage. "That was tremendous," summed up coach Rasic in the dressing room, his voice drowned by the popping of champagne corks. It was a double header. In the first match, Iraq beat New Zealand 4-0 and was now a point clear at the top of the ladder and Australia had to win against Indonesia to regain the lead and win the tournament. 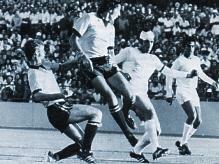 Socceroos Abonyi and Mackay, who had got two goals apiece, were the outstanding duo. 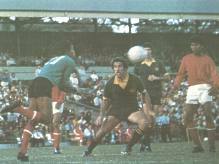 By half time, when Mackay had scored his second goal, Australia was leading 3-0. The Iraqi players, who understandably were Indonesias most ardent supporters, left the ground and went home. Mackay had opened the score in the 3rd minute when he latched on to a cross from Hogg and blasted the ball into the net. 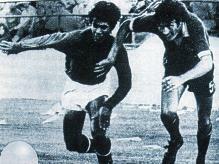 20 minutes later, Richards won a duel with Udjang, and raced down the line with it. Abonyi read his team-mate well and ran forward as he waited for the pass that he knew would be coming his way. He soon received that pass, and sent it into the back of the Indonesian net. Buljevic, who had been out of favour with the crowd for his less than satisfactory display against Iraq, set up the third goal when he dribbled through a maze of Indonesian defenders before giving the ball to Mackay, who made it three nil. He was than replaced at half time. Abonyi added another goal from the penalty spot, and Richards, who had already hit the woodwork twice, scored the fifth. Finally, Baartz completed the tally 12 minutes before the final whistle. Later Ray Richards was voted as the player of the tournament. Having won the contest, Australia advanced to a home and away play-off against Iran, winner of the Asian Sub Group B.